Call us today for concert tickets! Buy tickets in Advance On-Line for early-bird Discounts! When you are looking to enjoy live music in Marin, check out the performing arts center at the Osher Marin Jewish Community Center. Experience the community and creative expression of the Kanbar Center for the Performing Arts at the Osher Marin JCC. Since 1990, the Kanbar Center, formerly known as "CenterStage" has provided Marin residents with access to stimulating performances of Live Music, dance, comedy, lectures, concerts and more. Conveniently located in San Rafael, the Kanbar Center has established a strong and well respected reputation within the community as a center for Performing Arts, where community can celebrate the arts together! Our venues include the grand Hoytt Theater, the intimate Kurland Lounge, and Swig Field, home to our celebrated Summer Nights outdoor, family friendly music festivals. There's nothing like enjoying a good round of live performances. At Kanbar Center for the Performing Arts, we are committed to providing entertainment for the Marin, CA area. Check us out for comedy shows, live music events, and more. Our concert tickets are an amazing value for a great experience! The Kanbar Center Offers Concerts, Comedy Shows & More! Kanbar Center is a performing arts venue in the Marin, CA area. At our great venue we book several different types of entertainers from comedians to DJ's who provide live music, laughs and more. Call or stop at our performing arts box office today to get your concert tickets for our next event. Programs are available to the entire community with NO membership or Jewish affiliation ever required to attend. We help our community to come together and enjoy the performing arts. We are proud to host top talent from across the country, bringing live music, comedy shows, and more here to Marin. Plus, we strive to keep our ticket prices affordable in order to bring our work to the widest possible audience. If you are looking something fun to do, we have you covered! Experience the performing arts and get in touch with us today. Tourists and locals alike are discovering what those in cultural circles have known for years; the finest performing arts in the world, you need not look any further than Marin. At Kanbar Center For The Performing Arts offers a unique blend of cutting-edge performing arts and well known classics in a variety of intimate settings. From musical theater to classic drama and everything in between we offer an abundance of talent and entertainment on the stage. Come out and hear our live music today! Performances at our performing arts center run a wide range of styles including jazz, world music, internationally know chamber ensembles, bluegrass, Euro-mash, dance, comedy, lectures, and film. A typical set-up may be intimate lantern lit cabaret tables of 4 and theater style seating around the perimeriter of the grand Hoytt Theater. There is often room for dancing when appropriate, and concessions of snacks, beer, wine and cocktails are available for purchase and allowed within the theater. The beautiful lobby and atrium add to the experience, and create the perfect space for the typical post-event meet and greet with artists. In addition to public events, these beautiful venues are available for rent for a variety of private events - including weddings, fundraisers, Bar/Bat Mitzvahs and more! As a steward of the Local Community, and the entire Bay Area, the Kanbar Center for the Performing Arts takes great pride in making the arts available to local schools, non-profit organizations and families. The Summer Nights programs captures the imaginations of kids and adults creating an opportunities for multi-generations to come together and celebrate each other and the arts as a part of the every day experience. These events celebrate the cultures of the world, bringing people together through music, play, dance, creative expression, social opportunities, family and friends. Kanbar Center For The Performing Arts At The Osher Marin JCC offers the best live music and entertainment. If you are sitting around trying to think of something to do in the Marin area, consider joining us at the performing arts center for some outdoor fun. In the summer, we offer live music by various talented artists. This is known as our Summer Nights series. It is a big hit for friends and families who like to spend time with each other outdoors, enjoying the beautiful Marin atmosphere. Concert tickets can be purchased in a series for Summer Nights. Single concert tickets are priced at $85 for all 5 concerts, individually for $20 for members and $22 for the public. Also, tickets are sold at the door for $25 and groups of ten or more are $18 per person. Enjoy Summer Nights in the turf area. Make sure you bring a blanket or a low backed lawn chair. A cabaret table for 4 can also be purchased. The series tickets are $450, and individual tickets are $100. These tickets include a reserved table for four people. A picnic table for 8 is the last concert ticket option. Choose from individual concert tickets or series packages. Call today to reserve your table! The Osher Marin JCC provides people with life enhancement opportunities. Various activities which reflect the unique values of Jewish culture are held, and are open to the entire community. Our award-winning pools and state-of-the-art fitness center, family-friendly environment, stimulating educational and cultural programs, entertaining Performing Arts center, award-winning early child education center, and summer day camps are just a few of the special events available through the Osher Marin JCC. Call our office or visit our website to learn more about our upcoming shows and to purchase tickets. We have a wonderful lineup scheduled and would love for you to join us! Gather your friends and visit the Kanbar Center for the Performing Arts at the Osher Marin JCC for live music, readings, dramatic events and more. The Kanbar Center for the Performing Arts at the Osher Marin JCC is your source for fun things to do this summer. If you're looking for live music concert tickets in a beautiful location at the right price, give us a call or check us out online to learn more about our upcoming performing arts series. We entertain people from all over the Marin, CA area and look forward to helping you! When you're looking for something different to do in Marin, CA try the Kanbar Center for the Performing Arts at The Osher Marin JCC! Our performing arts center provides the best concert and live music events around. You're sure to find something fun and exciting to break up your routine. Call today to learn more about our event schedule and reserve your seats! There is nothing like experiencing a live performance. Whether you're attending a concert or seeing a play, the magic of the performing arts appeals to us all. The Kanbar Center for the Performing Arts at the Osher Marin JCC offers concert tickets, live music and other performances to appeal to all tastes in the Marin, CA area. Call or check out our website to reserve your place at our next show! Since 1990, the Kanbar Center for the Performing Arts at the Osher Marin JCC has established a strong and well respected reputation within the community as a Center for the Performing Arts in Marin County. Venues include the grand Hoytt Theater, the intimate Kurland Lounge and Swig Field, our outdoor venue nestled against the hills of Marin and home of our celebrated Summer Nights outdoor, family friendly music festivals. Performances run the gamut from classical to world music, dance to comedy, lectures and film to culinary demonstrations. 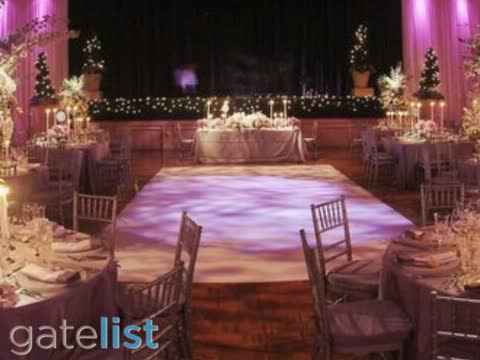 In addition to all of this, our beautiful spaces are the ideal place for a variety of rental applications including weddings, fundraisers, Bar/Bat Mitzvahs, and life celebrations. We invite all to come celebrate with us.